Finally the wait will be over in few hours for the iPad2 the Tablet for the year 2011. 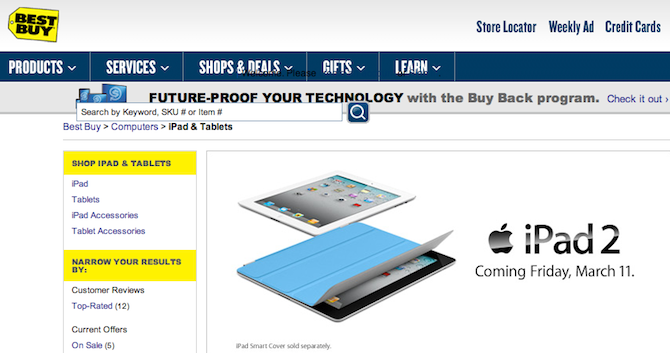 Apple has confirmed that they will be they will put on iPad2 on sale Tomorrow and people can order online as well. Apple Store opens iPad 2 sales at 5PM (be prepared to wait while people get their iPad 2?s set up)5 p.m. will also be for AT&T, Best Buy, Target, Verizon Wireless, Walmart and select Apple Authorized ResellersiPad 2 will be available in Australia, Austria, Belgium, Canada, Czech Republic, Denmark, Finland, France, Germany, Greece, Hungary, Iceland, Ireland, Italy, Japan, Luxembourg, Mexico, Netherlands, New Zealand, Norway, Poland, Portugal, Spain, Sweden, Switzerland and the UK on March 25; and in many more countries around the world in the coming months. Further international availability and pricing will be announced at a later date. CUPERTINO, California—March 10, 2011—Apple® today announced that iPad™ 2, the next generation of its magical device for browsing the web, reading and sending email, enjoying photos, watching videos, listening to music, playing games, reading ebooks and much more, will be available tomorrow at 5 p.m. local time at all 236 Apple retail stores in the US and through the Apple Store® (www.apple.com) beginning at 1 a.m. PT. Every customer who buys an iPad 2 at an Apple retail store will be offered free Personal Setup service, helping them customize their iPad 2 by setting up email, loading new apps from the App Store? and more, so they’ll be up and running with their new iPad 2 before they leave the store. iPad 2 will also be available beginning at 5 p.m. local time at AT&T, Best Buy, Target, Verizon Wireless, Walmart and select Apple Authorized Resellers.